I assume that Action did not have 17 page stories, so it must be from the Superman title. It appears to be from an unpublished 1940 Superman story which would have basically been the first Kryptonite-style story. I concur. I've contributed to the K-Metal story project and in some cases they are using the original artwork if it's known to exist, or they're creating new pages using Jerry Siegel's original -script. It's a fascinating project. It appears that Wonderworldcomic has found one more long-lost page. That's quite a treasure. k-metal.cc you'll get more background on it. I'll bet the people involved in re-creating this story would be delighted to see the original art too. Wonderworldcomic, do you own that piece? I bought it from one of the bigger auction houses 14? years ago. They labeled it as a Superman #17 page. I never had the comic to look up, so didn't doubt it. . Recently I noticed that it was page 17 and wondered if the 17 on the top indicated the page number instead of the issue. This sure seems like a page from the unpublished #8 story. I still need to ID a Wolverton Spacehawks partial page from Circus Comics #? I'll try to post it later. 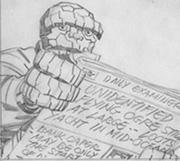 The GCD list the art for the other stories (in Superman 8) as Wayne Boring or Paul Cassidy. I would lean toward Cassidy for your page but one of the other inkers (Komisarow) might have masked the work by Boring. By the way, there are some nice ads in that issue. Those Atlas superhero OA pieces are awesome!